Black Panther can be enjoyed and appreciated by all audiences, but it’s most fully felt by a chosen few. The film’s deepest resonance is reserved for those with a (literal) kinship to African heritage, a cinematic connection and celebration that’s the unquestioned intent of director Ryan Coogler, whose previous films, Fruitvale Station and Creed, spoke to the contemporary African-American experience. As the film opens, Prince T'Challa (Chadwick Boseman), aka the Marvel superhero Black Panther, is poised to become king of the fictional African nation of Wakanda, following the death of his father shown in Captain America: Civil War. The equatorial kingdom has flourished for centuries thanks to a seemingly unlimited supply of vibranium, the extraterrestrial, indestructible metal that comprises Captain America’s shield but whose more mysterious properties have allowed Wakanda to become a technological paradise. Its city streets teem with a contented, eclectic citizenry ranging from austere elders to afropunk millennials, including T’Challa’s sassy sister Shuri (Letitia Wright), a whiz teen who gets her kicks ribbing her older brother and heading Wakanda’s version of Q-Branch. This cradle of civilization is also intentionally shrouded from the outside world to preserve both its resources and its denizens’ quality of life. 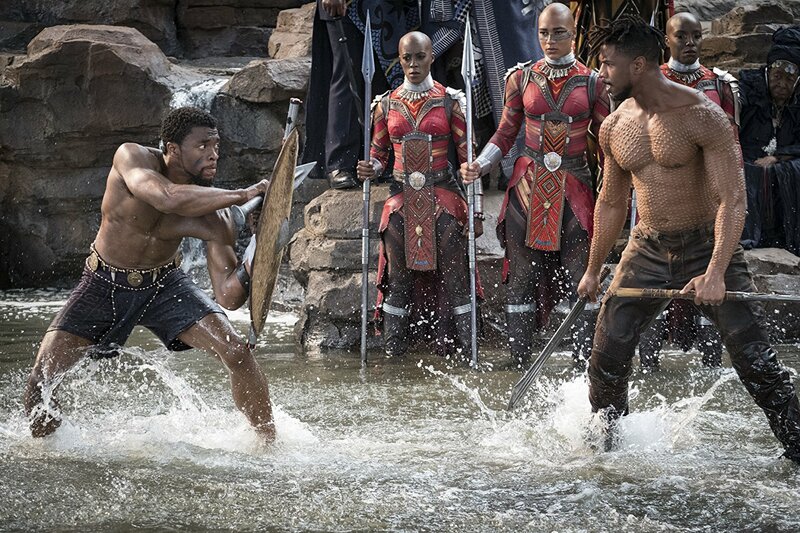 Black Panther is initially a heady heist flick, as T’Challa and his former lover Nakia (Lupita Nyong'o), along with other members of the Dora Milaje, Wakanda’s all-female elite guard, venture to South Korea to retrieve a hunk of vibranium pilfered by Ulysses Klaue (Andy Serkis), a longtime nemesis and snarling Afrikaner who embodies the ignominious legacy of Europeans plundering African resources and artifacts. 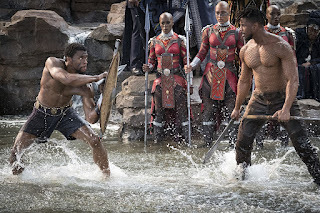 The film’s focus soon shifts to Klaue’s partner, Erik Stevens (Michael B. Jordan), who eventually arrives at Wakanda’s border bearing a gift, a secret backstory, and a lifelong grudge against T’Challa, his family, and the country’s ruling class. The schism between T’Challa and Erik is rooted in an allegory as old as Cain and Abel, or Jacob and Esau. But their divide is over more than birthright. T’Challa earnestly embraces Wakanda’s long-standing policy of peaceful isolationism, protecting their most precious and potent natural resource to prevent its pillaging and proliferation. Erik, on the other hand, was reared on the mean streets on Oakland, and both his tragic upbringing and eventual service as an American black ops soldier exposed him to the systematic oppression of dark-skinned people worldwide. Erik sees Wakanda’s stinginess as a sin, and his alternative is arming the oppressed and imposing equality at the point of a vibranium spear. T’Challa and Erik’s opposing approaches fall in the lineage of philosophical rivalries between African-American activists and their contemporaries: Frederick Douglass and Henry Highland Garnet; Booker T. Washington and W.E.B. Du Bois; Martin Luther King, Jr. and Malcolm X. Jordan’s charisma only adds to make Erik Stephens, aka “Killmonger,” that most rare of compelling movie villains: both detestable in his methods and righteous in his cause. That’s a lot of seriousness to extract from a genre that typically shouldn’t been treated so serious. Black Panther is a serviceable action film, and when the next Avengers movie rolls out in two months, Black Panther will be another cog in another battle royale against some CGIed baddie. But for now, in the hands on Coogler and company, Black Panther’s real attraction is its milieu, an exquisite, searing crossroads of race, gender, age, class, politics, and culture. It speaks to everyone, yet some more than others. It’s about time.